I need to cut a29 1/2 degree bevel on a 10” x 5/8” board. I have a 12” compound miter saw. bandsaw, table saw, jig saw, and an abundance of frustration. Any help would be greatly appreciated. We need some more info on the size of your board and what end or side you need to bevel. 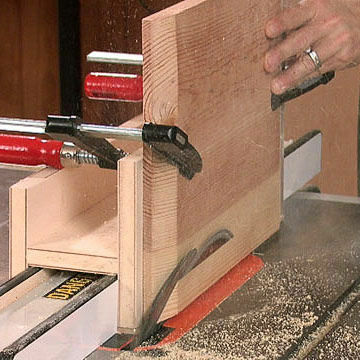 An end cut could be done on miter saw or tablesaw with miter gauge. A long side would be best done at the tablesaw with the rip fence, but you want to bevel it before you make it narrow. Meaning bevel the edge of a wide piece and then cut the piece off afterward. FYI…..I’m a St. Louis Cardinal fan from St. Louis. Bill’s got it…except for that Cardinal thing. When you say that you need the bevel “on that end”, do you mean that you need to crosscut a 29.5” bevel that is 10” long? Sorry to be so dim, but I think that is what the others are asking too. If this is what you need, I would use a table saw sled, tilt the blade to give you a 29.5” bevel and cross cut it. If your compound mitre saw is a slider and it will cut 10”, you could do the same cut with it. Perhaps you mean 60.5 degrees. This sort of thing? I think we have Bingo there! Mark, I used a jig very much like Loren’s to cut a 22.5 degree bevel for flag cases. It’s one of those jigs you’ll keep forever. It’s super easy to build and cheap. This is the worst advise I’ve come across here for a long time. Guess what happens when the board slides into the black on the back a very little bit. A. The blade will raise the board a small bit. Normally this is not a problem but in this particular case the blade has nowhere to go and pushes into the blade more. You do not need to be a genius to predict what happens next. I fixed my “problem”. Simply a case of bad planning on my part. thanks to everyone for helping. This is one great place. This is the worst advise I ve come across here for a long time. Guess what happens when the board slides into the black on the back a very little bit. I am curious what others think about the practice shownin the picture. I, like Carloz, got a sinking feeling in my gut when I first saw it. That is an accident waiting to happen IMHO. I am curious what others think about the practice shown in the picture. I, like Carloz, got a sinking feeling in my gut when I first saw it. That is an accident waiting to happen IMHO. Disaster waiting to happen in my opinion. Specifically, as he finishes the cut the support point will change as the waste is cut off. The edge of the board will fall into the large gap and cause bad things to happen.